Recently malware experts working at our internal labs have noticed a significant spike in a development of ransomware programs, which, it goes without saying, are extremely dangerous. One such malicious program goes by the name of Crypren Ransomware. If this malware is ever found active on your PC, you must take immediate measure to remove it if you want to to maintain your personal data safe and secure. If you hesitate just for a few minutes, you will most likely lose the majority of your personal files and could even expose your operating system to other invasive and potentially malicious software. Make sure to read the rest of our report to find out how this ransomware works and what you should do to avoid it. In addition to such crucial information, we also provide a comprehensive removal guide that must be used to completely terminate Crypren Ransomware from your PC once and for all. At first, you might not even notice that Crypren Ransomware is already fully functioning on your operating system. This is so because the devious program could act in a silent manner once it gains full access to your personal computer. Usually, the first major indication that it is up and running on your computer is a pop up of a window within your web browser. This window usually contains a ransomware note, that will inform you that your data such as documents, photos, videos, and databases have been encrypted; thus, they are no longer accessible. All the encrypted data will appear with a ".encrypted" extension. You then will be asked to pay up within for an ability to decrypt your files. According to the message presented to you, if you fail to do so, the unique key that is paramount to the decryption procedure will be destroyed. This means that your files will be compromised once and for all. We firmly advise you not to pay for the dubious decryption services since they could turn out to be a hoax as there is no guarantee that the developers of Crypren Ransomware have any interest at all to decrypt your data even if you chose to pay them. It should be more than obvious that such functionality of this malware program should not be ignored as it could cause devastating outcomes, to put it mildly. 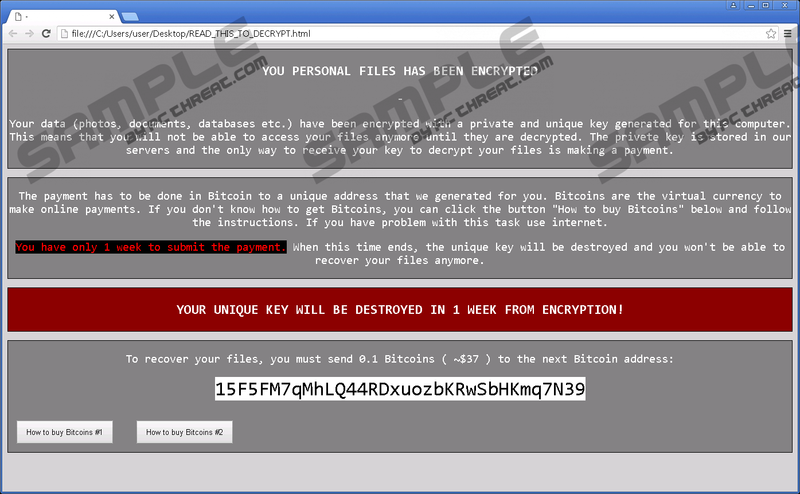 Make sure to use the instruction that we provide below to get rid of Crypren Ransomware as soon as possible. During our investigation it has been discovered that in the majority of cases this malicious ransomware application is spread via spam e-mails. Often such emails have deceiving titles to lure naive Internet user into opening them and obtaining attachments. If you wish to avoid programs like Crypren Ransomware, you must take safe browsing seriously. It is crucial to avoid any questionable websites at all times as well as you should never open dubious e-mails form unknown senders. Various third-party sites tend to host dubious installers and spam e-mail is rather infamous for being favored by malware developers as a way to spread their invasive software. In addition to all of this, you need to have a professional malware detection and removal tool on your operating system at all times since it is capable of detecting any questionable web content in advance. Thus, such a program can warn you about any suspicious or potentially malicious e-mail attachments, websites, or files in advance. If you practice safe browsing habits along such a tool, your operating system will become virtually unbreakable. The complete removal of Crypren Ransomware should be of your utmost importance since leaving it active on your operating system is a risk that no user should take. Make sure to execute each step carefully since a single mistake could mean that the malicious program was not removed from your operating system entirely, meaning that it could still function in an invasive and aggressive way. This is the main reason we highly advise you to check your operating system for other leftovers linked to Crypren Ransomware once you are done with a manual removal. If you do not feel comfortable performing such a task yourself, we recommend using a professional antimalware tool; you should scan your whole operating system with it as it can automatically detect any dubious traces. Locate malicious executable files and remove them. No go to C:\Users\User\AppData\Roaming\Microsoft\Windows\Start Menu. Find and then delete the malicious HTML file implemented by this malware. Finally, you must Empty Recycle Bin. Quick & tested solution for Crypren Ransomware removal.